Despite its durability, the hip joint isn’t indestructible. With age and use, the cartilage can wear down or become damaged. Muscles and tendons in the hip can get overused. Bones in the hip can break during a fall or other injury. Any of these conditions can lead to hip pain. If your hips are sore, here is a rundown of what might be causing your discomfort and how to get hip pain relief. Our team at New Mexico Orthopaedics takes a multidisciplinary approach when it comes to treating hip pain, degeneration or conditions. Read about our Hip & Pelvis Specialists here. Hip fractures. With age, the bones can become weak and brittle. Weakened bones are more likely to break during a fall. Bursitis. Bursae are sacs of liquid found between tissues such as bone, muscles, and tendons. They ease the friction from these tissues rubbing together. When bursae get inflamed, they can cause pain. Inflammation of bursae is usually due to repetitive activities that overwork or irritate the hip joint. Tendinitis. Tendons are the thick bands of tissue that attach bones to muscles. Tendinitis is inflammation or irritation of the tendons. It’s usually caused by repetitive stress from overuse. Muscle or tendon strain.Repeated activities can put strain on the muscles, tendons, and ligaments that support the hips. When they become inflamed due to overuse, they can cause pain and prevent the hip from working normally. Cancers. Tumors that start in the bone or that spread to the bone can cause pain in the hips, as well as in other bones of the body. If your hip pain is caused by a muscle or tendon strain, osteoarthritis, or tendinitis, you can usually relieve it with an over-the-counter pain medication such as acetaminophen or a nonsteroidal anti-inflammatory drug such as ibuprofen or naproxen. Rheumatoid arthritis treatments also include prescription anti-inflammatory medications such as corticosteroids, disease-modifying anti-rheumatic drugs (DMARDs) like methotrexate and sulfasalazine, and biologics, which target the immune system. Another way to relieve hip pain is by holding ice to the area for about 15 minutes a few times a day. Try to rest the affected joint as much as possible until you feel better. You may also try heating the area. A warm bath or shower can help ready your muscle for stretching exercises that can lessen pain. 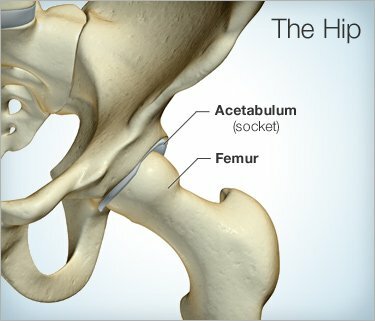 When osteoarthritis becomes so severe that the pain is intense or the hip joint becomes deformed, a total hip replacement (arthroplasty) may be a consideration. People who fracture their hip sometimes need surgery to fix the fracture or replace the hip.